We’d love your help. Let us know what’s wrong with this preview of A Mirror of Shadows by Dorothy Daniels. To ask other readers questions about A Mirror of Shadows, please sign up. Wherefore art thou, Victoria Holt? We've got ourselves a genuine goffick turkey. The premise behind Maeve's insta-love with Joel (and then her secondary lurve for (view spoiler)[her second husband (hide spoiler)]) was utterly ridiculous. 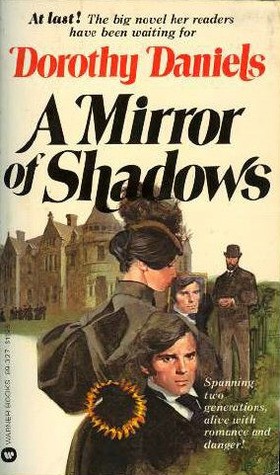 I'm ready & willing to swallow doofy WTFery when it comes to gothic romance -- truly, nobody can love this genre without expecting the occasional plot chuckle -- but the entire plot hinging on Queen Maeve's mirror was daft. Rarely have I read such a pathetic Wherefore art thou, Victoria Holt? We've got ourselves a genuine goffick turkey. MAEVE: It is decreed I will love this man I saw in the mirror. Therefore I will love him. MAEVE'S DAD: The mirror is a totally legit way to find your mate, because it happened to me & your mother & your entire family line. MAEVE: Look, it's the man I saw in my vision! JOEL: I love you so much. I want to marry you. I've known you 30 seconds & we're destined to be together. MAEVE: Zomg, I love you too! I haz a mirror. It tells me stuff. JOEL: I am totally okay with this mirror dictating my life. Oops, wait...someone is shooting at us. MAEVE: An agent of evil is trying to kill my one true love! JOEL: Nah, it was just an accident. MAEVE: Aye, sure & you're right. I'm Irish, see? JOEL: I'm American. I'm rich as sin. I've got no job & no plan to get one. MAEVE'S DAD: Lolz. How about you become a doctor? We could use the help around here. JOEL: I've never even read a book about medicine, but what does that matter? I can totally wrap casts & hand out herbal tea. You're my new family. MAEVE: The mirror picked such a noble, selfless husband for me to adore. Thank you, blessed mirror! Nonsensical mirror aside, the writing was absolute rubbish. Entire passages served no purpose whatsoever. The characters were flatter than flat, the dialogue was wooden, & the suspense was hammy with no sense of urgency. Brief scenes were strung together with an array of time gaps, while conversations jerked around with sad attempts at humor while they repeatedly discussed the same handful of topics over & over. Seriously, why must we rehash Cathal's hopeless lurve for Maeve, or have it explained that Maeve's father is a believer in the magic mirror, or suffer Maeve's warbling over a vague vision of her father's impending demise, or be reminded that her matriarchal family is decended from mythical queens? (Yeah, I got it the first 8 times.) This book takes 'padding your page count' to epic heights. It's so damned easy to fulfill a character's entire experience with a mirror to do her courting & all of her decision making for her. It's a sad premise to make the characters & storyline arrive on your doorstep than the characters actually going out into the world to live their lives for themselves. A no, a resounding NO. I had heard this was a good author but I found the reading repetitive and just above a history romance. I was disappointed.